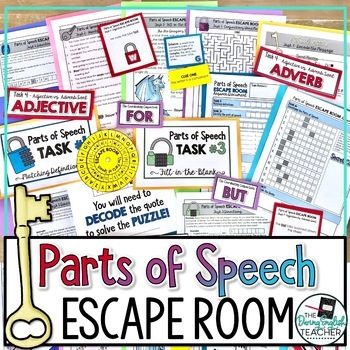 Engage your students with fun, exciting, and hands-on grammar instruction with this Parts of Speech Escape Room Breakout Activity! This escape room includes 7 different tasks to keep your students learning and problem-solving! This download includes teacher directions, student directions, all of the printable resources necessary to hold an escape activity in your classroom (including a paper answer key) and a, link to a Google Form answer key! Students match the parts of speech terms with their corresponding definitions and examples. Students identify the part of speech of a designated word in a sentence. Students read a super short story and fill-in-the-blanks with words of their choosing. Then students must identify the part of speech for the words they selected. Students will sort words (in context) into two groups: adjective or adverb. Then, students will unscramble the letters to reveal a hidden code. Students complete a conjunctions word maze and then using the acronym for the coordinating conjunctions, students identify which coordinating conjunction should be used for each sentence. Students use clue cards to identify the part of speech for various words in a sentence. Students decode a coded message about the parts of speech. 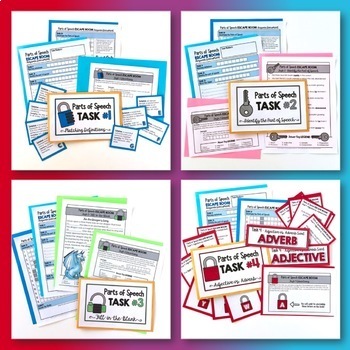 Students will complete seven different growth mindset tasks that rely on decoding, matching, sorting, and unlocking a hidden message. 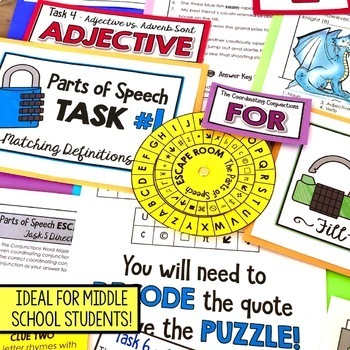 Throughout these seven tasks, students will work with various elements of the parts of speech.